Referendum Day is Friday 22 May 2015 and polling will be between the hours of 7:00am and 10:00pm. 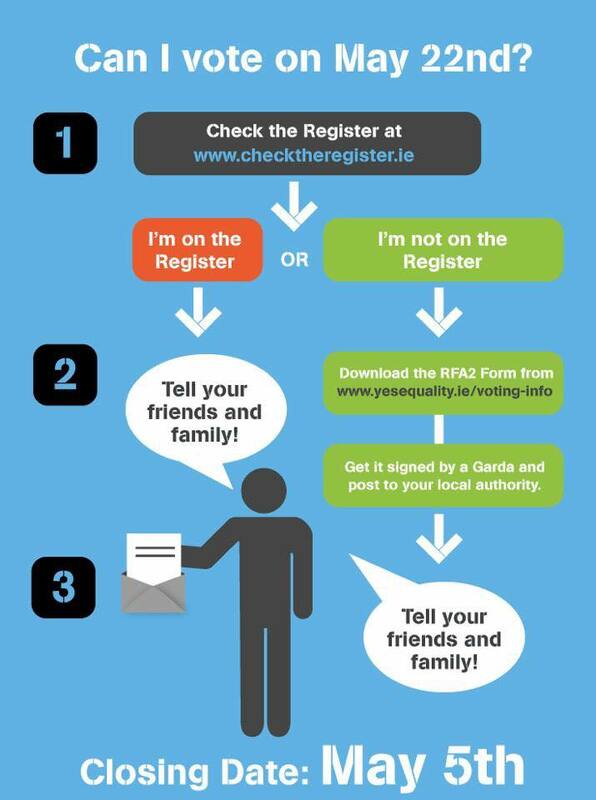 Are you on the Register of Electors? 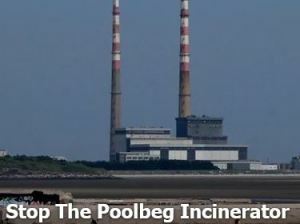 You can check at www.checktheregister.ie. 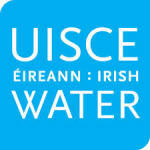 If not, there is still time to apply for inclusion in the Supplement to the Register in order to vote at the elections. To do this, you’ll need to download, print and fill out a Form RFA2. You must take the form to your local Garda Station (make sure to bring ID!) for authorisation before sending the completed form to the Franchise Section, Dublin City Council, Block 4, Floor 1, Civic Offices, Wood Quay, Dublin 8. The application form needs to be received by them not later than Tuesday 5 May 2015.
Who has the right to vote? – you are living in Ireland (or have emigrated within the last 18 months). This entry was posted in Uncategorized on April 27, 2015 by ccdas. 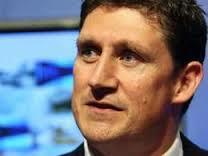 Party Leader Eamon Ryan has been selected to contest the Dublin Bay South constituency in the upcoming General Election. 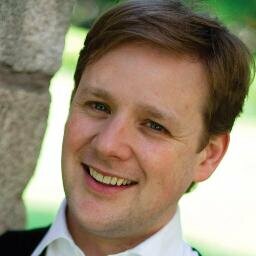 Ryan is a former Minister for Communications, Energy and Natural Resources and served as a TD for the old Dublin South constituency from 2002 to 2011, and as a Dublin City Councillor for the Rathmines Ward from 1998 to 2002. He has led the Green Party since 2011. Ryan said: “It is an honour to be selected to stand for our party in Dublin Bay South. I am looking forward to being part of the team of candidates who will be running across the country, seeking to return a Green voice to Dáil Éireann. We have a proud record of serving the Irish people at every level of Irish politics and a tradition of ‘thinking globally and acting locally’. That perspective has been missing from our parliament for the last four years. “It’s clear that the coming election will see a huge upheaval in Irish politics. Fine Gael and Labour have implemented the four year plan they inherited but lack a long-term vision for where we go from here. They are still wedded to an out-of-date economic ideology that relies on unregulated markets to deliver their policy goals. The opposition have protested about the impacts of the financial crash, but they are weak when it comes to proposing viable alternatives. “We believe an alternative economic model is starting to emerge which can deliver a secure and socially just future for everyone. It takes a more collaborative approach, relying on social enterprise and care for our environment, not sole reliance on the profit motive. New technology is driving a digital and clean energy revolution which will bring communities closer together and deliver the social revolution people clearly want. This entry was posted in Uncategorized on March 4, 2015 by ccdas. 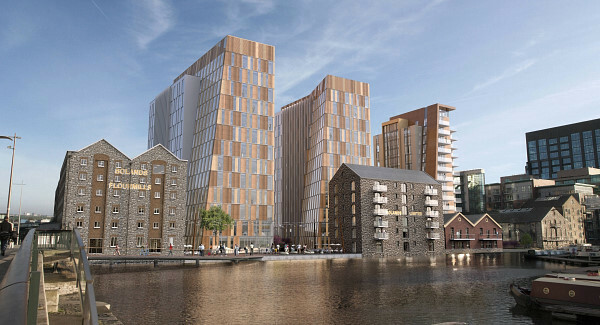 Green Party Councillor Claire Byrne passed a motion at the South East Area Committee of Dublin City Council to reject the Boland’s Mill proposal on grounds that it lacks sufficient housing, vision & creativity. 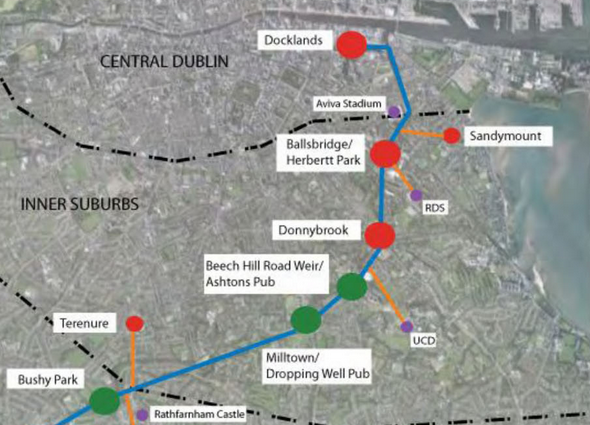 The South East Area of Dublin City Council covers medieval core of Dublin, the City’s premier shopping district, the cultural quarter of Temple Bar, Inner City commercial and residential districts and suburban villages such as Ringsend, Irishtown, Sandymount, Ranelagh, Rathmines, Terenure and Rathgar. 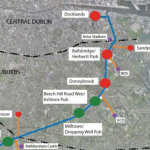 Dublin City Council is working on plans for a greenway between the Docklands and Milltown. Cian Ginty’s website www.irishcycle.com has a wealth of excellent information on the propose plans, which you can read, here, here and here. Cllrs Claire Byrne and Patrick Costello will be monitoring developments closely via the South East Area Committee of Dublin City Council. This entry was posted in Uncategorized and tagged bolands, cycling, rathgar, sandymount on January 20, 2015 by ccdas. 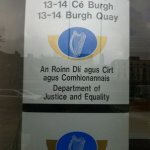 The Green Party has today stated its support for a campaign to reform the Garda National Immigration Bureau (GNIB) service, as the farce of people queuing all night for simple administrative documents worsens. 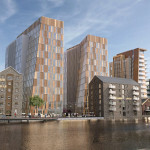 The Party’s representative for Pembroke-South Dock, Cllr Claire Byrne, has said that the current situation is quickly becoming a source of national embarrassment. Speaking today, Cllr Byrne said: “The nightly queues stretched around Burgh Quay are a national embarrassment, and I’m calling on the Garda National Immigration Bureau to find a solution to this problem. It is unacceptable that people are forced to queue up outside in the cold for twelve hours or more due to a lack of effort on the part of authorities to reform the system. “There are pregnant women, mothers and fathers with their babies, children and old people waiting on the streets for hours in the cold. It is degrading and humiliating, and the level of inaction on this issue is unforgivable. This entry was posted in Uncategorized on December 10, 2014 by ccdas. and real financial support for home conservation schemes. 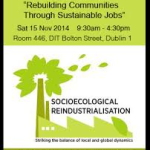 Green Foundation Ireland is holding a seminar on Saturday 15 November from 9:30am to 4:30pm at DIT Bolton Street. 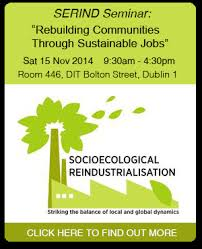 The Dublin SERIND Seminar will address this by examining the trends in the manufacturing and the supply of goods and services from a sustainable ecological standpoint like 3D Printers, Leasing vs Owning, Repair Cafés and social enterprises like the Ballymun Rediscovery Centre. Read more here about the seminar here. The Stop the Poolbeg Incinerator campaign on Facebook is organising a protest on Thursday 13 November at the Point Depot roundabout from 5pm to 7pm. You can read more about it here. Bike theft is a big and growing problem in Dublin. While only 4,500 bikes were reported stolen in Dublin in 2013 there is a problem with under-reporting problem and the Dublin Cycling Campaign estimate that the real figure was around 20,000. 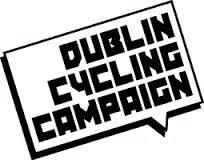 The information you will provide in this survey will be invaluable in helping the Dubiln Cycling Campagin design a plan, in conjunction with the Gardai, City Council, City Planners & bike trade, to tackle the problem. You can fill out the survey here. This entry was posted in Uncategorized and tagged cycling, incinerator, serind, water on November 10, 2014 by ccdas. Patrick Costello, recently elected to Dublin City Council in Rathgar – Rathmines, has travelled to the West Bank to act as a human rights observer in the occupied Palestinian territories between August and October 2014. This is a fund-raising event for Dodder Action (see facebook and dodderactiondublin.com) which asks for donations of E5 per adult for the walk or E10 with barbecue. 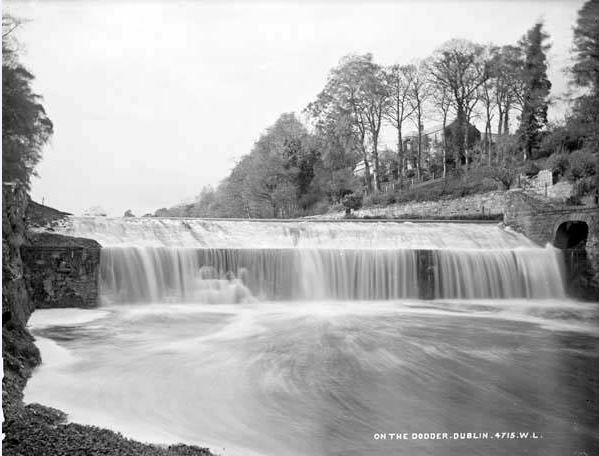 Dodder Action hosts historian Rob Goodbody’s amble along the River Dodder from Rathfarnham Bridge to the Packhorse Bridge, chatting about the river’s amazing industrial history and pointing out the remains of its mills and weirs. He will be joined at Packhorse by ecologist Tim Clabon who has recently conducted an otter survey and will tell us about the wildlife along the river. Barbecue to follow on riverbank! This entry was posted in Uncategorized on September 8, 2014 by ccdas. 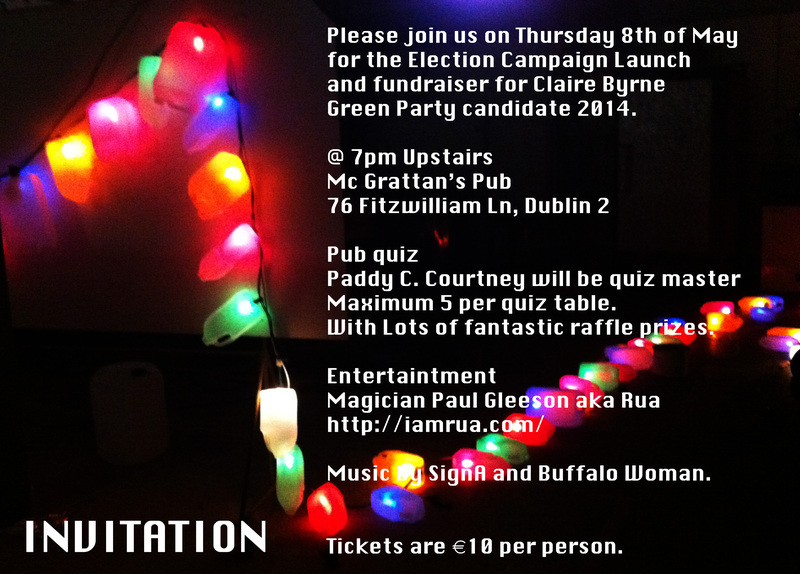 Let’s get the Green vote out…! There are only a few days left to election day. Please remind everyone you know who is interested in green issues that they need to vote for the local and European candidates who most reflect their views. You can find a full list of Green Party candidates here. If you live in Dublin, please remember to support Eamon Ryan for MEP, in South Grace O’Sullivan, in Midlands North-West Mark Deary and in Northern Ireland Ross Brown. 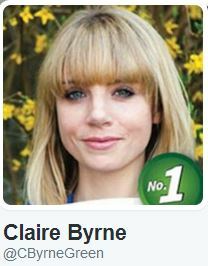 If you live in either of the local election wards in Dublin Bay South (Pembroke South-Dock or Rathgar-Rathmines) then your local candidates are Claire Byrne and Patrick Costello. Both candidates have a great chance of getting elected but they need people like you to vote for them. Please make sure to support them on election day and please encourage anyone you know to vote for them. This entry was posted in Uncategorized on May 19, 2014 by ccdas. 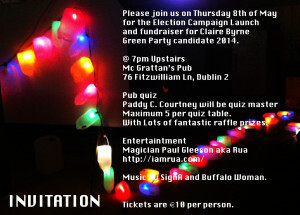 Claire Byrne’s Election Campaign Launch and Fundraiser will be held at 7pm in McGrattan’s, 76 Fitzwilliam Lane, Dublin 2. See invite below for details. This entry was posted in Uncategorized on May 6, 2014 by ccdas. I am the local election candidate for The Green Party in Pembroke – South Dock. I have been living and working in this area for over ten years and have a particular interest in the community as a result. Currently I work as an Environmental Education Specialist with a local company called Real Nation, developing education programmes for schools nationwide. I also work for The Body&Soul Festival as their Sustainability Manager and with an events collective Happenings.ie, producing pop-up cultural events across the city. My experience in politics stems from six years working with Eamon Ryan, former Green Party TD and Minister, and your European Election Candidate 2014. During this time I managed the local constituency and represented Eamon in both Dun Laoghaire Rathdown and South Dublin County Councils. I am running in the local elections because I strongly believe that local politics matters. I want to bring my experience at both a local and a national level to Dublin City Council, to create positive change based on your needs as a member of the local community. I want to be part of a City Council that values the future of its citizens by putting economic, social, political and environmental sustainability at the heart of the decision making process. I firmly believe only a green voice will deliver this. Therefore I am asking for your number 1 vote on May 23rd. I’m looking forward to meeting you in the coming weeks. In the meantime please feel free to contact me as I am interested in your questions, thoughts and ideas. Economy: providing substantial support for local, social, creative and green enterprise to create jobs, and to ensure progressive and accountable management of the city’s finances and local taxes. Politics: promising clean, transparent, honest, democratic and effective local politics. Arts: supporting the artistic community with a more focused appreciation and recognition of the city’s creative culture. Environment: delivering responsible management of the city’s resources to maintain a healthy, clean city and protect us from the challenges of climate change. Transport: providing better facilities for drivers, pedestrians, public transport users and cyclists. Society: ensuring equal distribution of the city’s finances, promoting equality, supporting and strengthening local communities and encouraging civic pride in our city. Please feel free to contact me as I am interested in your questions, thoughts and ideas. This entry was posted in Uncategorized on April 23, 2014 by ccdas. The local elections will be held with the European elections on Friday 23 May 2014 and polling will be between the hours of 7:00am and 10:00pm. 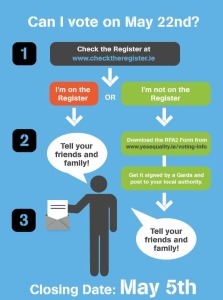 You can check at www.checktheregister.ie. If not, there is still time to apply for inclusion in the Supplement to the Register in order to vote at the elections. For inclusion in this Supplement, application forms will need to be received by the Franchise Section of Dublin City Council not later than Tuesday 6 May 2014. For those seeking inclusion in the supplement to the postal and special voters lists, the application forms will need to be received by the Franchise Section of Dublin City Council not later than Saturday 26 April 2014. 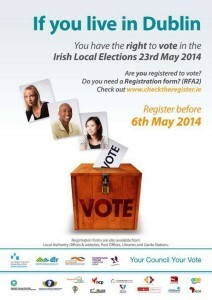 Irish, British and other EU Citizens: can vote at the European and local elections. Non-EU Citizens: can vote at the local elections. This entry was posted in Uncategorized on April 13, 2014 by ccdas.